View More In Bluetooth & FM Transmitters. 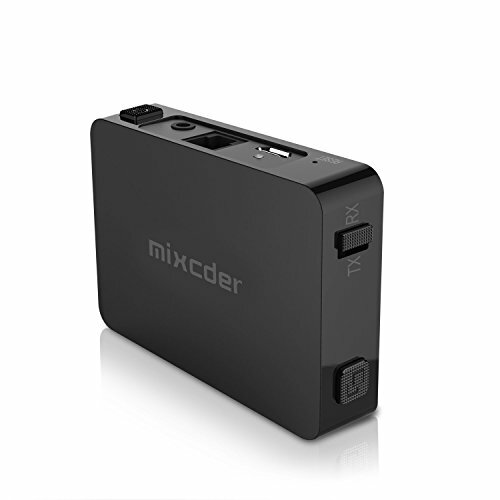 The Mixcder TR008 Bluetooth Transmitter supports the latest Bluetooth 4.2 and the CODEC of APTX-LL Low Latency in BOTH the TX & RX modes. It can effectively minimize audio latency and enable you to watch video without noticeable lag. You can share great music with your partner by simultaneously pair and stream to two headphones / speakers at the same time, enjoying the audio seamlessly; The Bluetooth range can be up to 10m for both devices. Turn the toggle switch to the "TX" position. The TR008 will be in a wireless transmitter mode. Press the switch button for about 3 seconds, then the blue LED flash slowly,then press the "pairing button" once,the blue LED flash quickly,it's ready for pairing mode. Turn the toggle switch to the "RX" position. The TR008 will be in a wireless receiver mode. Press the switch button for about 3 seconds, then the Red LED flash slowly, then press the "pairing button" once,the Red LED flash quickly,it's ready for pairing mode. [ADVANCED BLUETOOTH V4.2+EDR] Bluetooth 4.2 Receiver delivers high quality audio sound with aptX-LL, allowing you to enjoy HiFi stereo music without wire restriction and offers you 30 feet operation range with good performance. [2-IN-1 DESIGN] One switch between TX and RX mode. Transmitter mode (TX): turn a non-Bluetooth TV, PC, CD player, MP3 / MP4 into a Bluetooth transmitter while pairing with Bluetooth devices; Receiver mode (RX): turn a non-Bluetooth speaker, headphones into a Bluetooth Receiver, especially ideal for home or vehicle music streaming sound system. [CABLE-FREE ROAMING] Turn your wired headphones or old stereo into Bluetooth and enjoy great music cable-freely; support 2 receiving devices in TX mode and pair with smart phone or tablet from up to 30 feet away. [2 CONNECTION PORTS ] The additional optical fiber offers one more choice besides the 3.5mm stereo/audio cable, widening the range of application, making your old sound system capable of wireless connection with the latest smartphone, tablets, iPad, and computers. [LONG STANDBY TIME ] The built-in large capacity 500mAh battery provides up to 18 hours playing time with only 2 hours charging time; the universal USB cable makes charging easier on any occasion. If you have any questions about this product by Mixcder, contact us by completing and submitting the form below. If you are looking for a specif part number, please include it with your message. CHOETECH Bluetooth Transmitter Receiver 2-in-1 3.5mm Bluetooth V4.1 Wireless Stereo Audio Adapter Hands-Free Car Kit Compatible Headphones, TV, PC, MP3/MP4 Player, iPod, iPhone, Tablets ECT.